It’s been on my mind to move my doll website from where it’s hosted to a WordPress blog which I find so easy to update and maintain. I don’t like the way my current site sits with outdated information as though time stopped at some point in 2009. In some ways, though, it did. That wasn’t the only thing to suffer from the writing bug taking over my life. To keep my foot in the door of the doll world, and because I love the company of these women who aren’t afraid to say they still play with dolls, I belong to a UFDC doll club in my area. We’re getting ready to host a function next month, and part of that is a display of dolls representing other countries. A few weeks ago, I had to hand over one of my dolls to the member in charge of the display. I put her on a stand, and as I was fussing with her clothes and smoothing her hair, I realized how dearly I miss playing with my dolls. 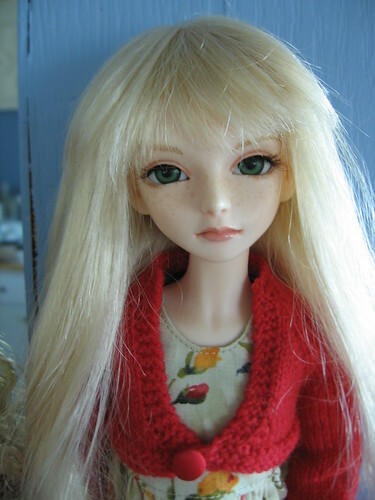 Jessica is a Bobobie Espree, 43cm resin BJD. This is probably my favorite faceup that I've done. What I love about making sewing patterns is not only how much quality time I get to spend fussing over the dolls, but I like knowing that those using the patterns will be fussing over their dolls. It’s something I want to pick up again. I haven’t been active in the online doll community for some time, but given that there’s still interest in the Blythe patterns I put out a few years ago, I’d guess people still love her. I know I do. I’d love to put out a wider variety of patterns for her. I have a family of twenty BJDs, most of whom are wearing quite disreputable clothing and need attention. This year I’ve added some vintage dolls to my collection this year, for the first time. A 20″ Cissy, and a small collection of 10.5″ fashion dolls. I don’t even have pictures of those yet. And I think I’ve managed to acquire all of the Monster High characters currently available. My daughter loves these dolls especially. If anyone deserves the title of “fashion dolls,” it’s this crew. Their bodies are tiny, with a unique shape. Definitely a challenge to fit, and one I’d like to try. Anyway, those are some of the things I want to work on, as well as this new site to share them with you. Thanks for listening to me babble. i LOVE YOUR FOTOS!!!!!!! OM GOSH!!! !!!!!!!!!!!!!!!!!!!!!!!!!!!!!!!!!!!!!!!!!!!!!!!!!!!!!!!!!!!!!!!!!!!!!!!!!!!!!!!!!!!!!!!!!!!!!!!!!!!!!!!!!!!!!!!!!!!!!!!!!!!!!!!!!!!!!!!!!!!!!!!!!!!!!!!!!!!!!!! !